Once you’ve chosen your perfect stove, what happens next? 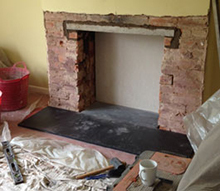 The installation process often starts with a photo of the existing chimney breast or proposed location of the stove. The next step is to decide how the fire opening will be prepared. Would you like it plastered smooth, rendered in a country style or finished with granite, slate or marble? The hearth and the mantel can match, or you could finish it with a simple beam available in a variety of hardwoods. To help you choose take a look at our pages on marble and stone fire surrounds and our section on wooden surrounds. Examples of stone, marble and wooden surrounds are also on display in our Coventry showroom. Once you’ve selected your stove and opening style, we can arrange for a HETAS registered independent installer to come to your home to undertake a site survey. This survey looks at the exact requirements of the installation, including chimney liner length, hearth size and room ventilation requirements. Your installation team will arrange and bring everything necessary to complete the installation, including any necessary scaffold, ladders, cherry pickers etc. Installation is typically within two to three weeks of your order. Customers often ask us if they will need to change the carpet in the room where the stove is to be installed. The answer is not necessarily, often we can adjust your hearth size without effecting your carpet. Carpeting is also protected throughout the installation. At the end of your installation, your installer will conduct a smoke test on your appliance, and show you how to use it. You will be given a HETAS installation certificate. With every installation, we keep any mess or disruption to an absolute minimum. Carpets are protected and often hearths can be adjusted to ensure you can keep your existing carpet.